There must be some good snow growth because this is snow globe stuff. Like 5sm -SN but with huge floating flakes. Yeah coming down nicely over here too JSpin. Just starting to accumulate on the cars. Solid bursts this evening... everything is accumulating now except for pavement. 35.4/25F very light snow just started. Love to see an inch to keep things whitened over the weekend. First inch down. Still snowing pretty good. This is certainly exceeding the event from last week to become the largest of the season so far around here. Man what a beautiful night out there. 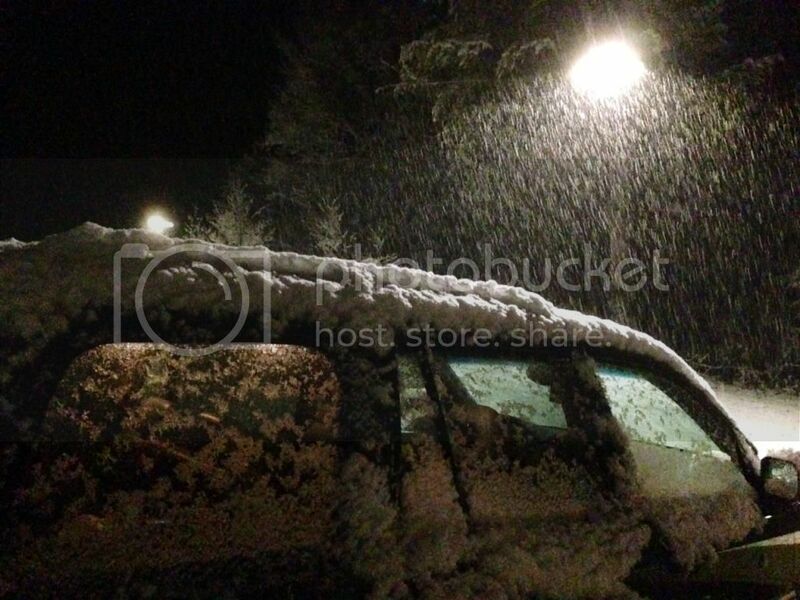 1.5" in town and 2.0" at the ski resort. Trees are beautiful in town. 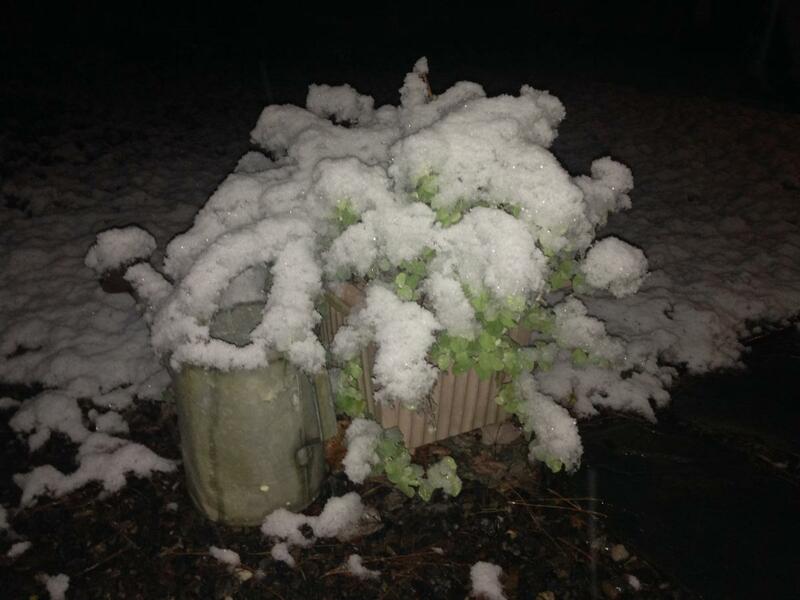 Event totals: 1.3” Snow/0.12" L.E. I ran a 10:00 P.M. analysis on the event here, and the data are below. The snowfall rate has certainly slowed somewhat, but there should be a bit more accumulation to report in the morning. unexpected ~2" here. Decided to get out under the flood lights for a sticky ski around the yard. Need the ground to freeze now. Yeah just measured 2" exactly. Nice surprise. So I dropped my ruler in the snow and couldn't find it in the dark after the first measurement... but I have a paper cutter with measurements on it. So I took an index card and copied the paper cutter grid measurements onto the card. Accurate to the nearest half inch, lol. Anyway... 2.0" on elevated surfaces. Jvt24, I see you lurking, what did you have over there? Looks like we've got one more band to come through...but we'll have to see if it makes it to this side past the Spine. The flow looks to be going more blocked so the echos are getting their boost on the west side and washing out on the east side now. Even the CPV got on the board with this one. We had up to 0.2" or so it looked like depending on the surface. I went to Montgomery Ctr. this evening to play a show (I am a singer-songwriter also), and it was snowing steadily there as I left. As I headed west the intensity varied as did the accumulation, but nothing on the road. Some of the heavier snow I saw was actually in St. Albans before it quickly shut off as I headed south on I-89. The dusting at home was residual from whatever fell earlier. It was nice to see. Sweet! Looks like its pretty similar around town then. 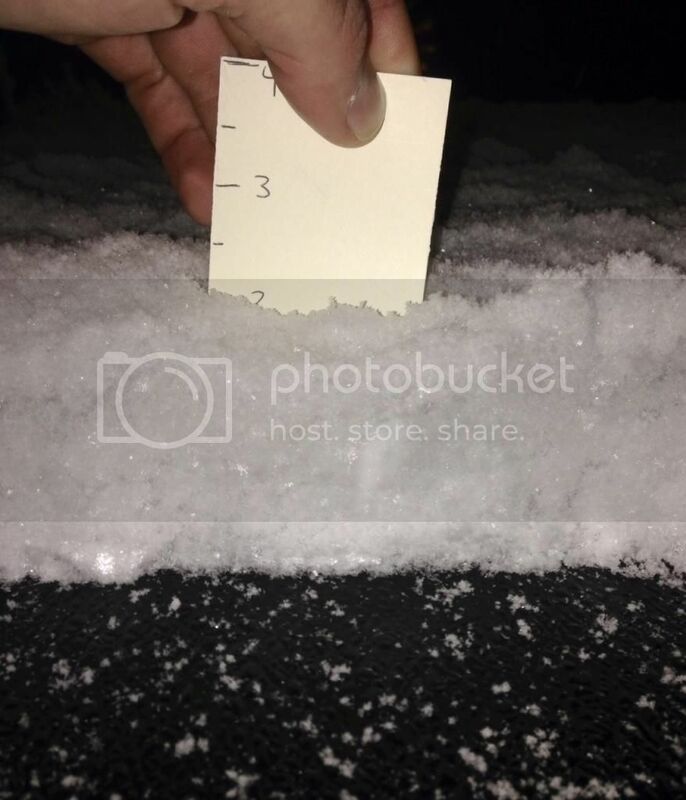 I'm heading to bed but final index card measurement is 2.25" as this final band moves through. Ground is still warm, so no pavement accums throughout the snowfall, and although the temperature has been 31F the past hour or two, it seems to be melting from the bottom-up in certain areas, haha. This was the season starting event in town for something other than a couple tenths of snow grains. It isn't much but the .2" starts the season total, only a trace on a few other occasions so far. It looked like literally 50-100ft higher got a much thicker coating. Posted this in the other thread... beautiful morning here in Bartlett! I agree snow growth was not a problem in this event. The flakes were the real deal, and this is where I would say we have entered winter. BTV came in with 0.2" which is pretty much spot on. Event totals: 2.7” Snow/0.19" L.E. I didn't think there was going to be much in the way of additional snow falling after I took those 10:00 P.M. observations last night, but that rate of snowfall persisted, and even ramped back up with the passage of that final band, which really seemed to have its eyes set on the Chittenden County area and points eastward. With the ground being warm, the snow did have a harder time accumulating there initially, and there's only about two inches at the stake vs. a bit more on colder surfaces. In terms of local snowfall distribution in the Waterbury-Burlington corridor, the snow cover persists westward through Richmond, where there seemed to be a bit less than what we had in Waterbury, then Williston, where it's a healthy dusting to half inch, and even right into Burlington, where there's a dusting on cold and grassy surfaces. Unfortunately I'm not seeing much in the way of reports from the ski areas yet, but one of my students who lives near the base of Mount Ellen at Sugarbush said that she picked up about 4 inches. AS OF 626 AM EST FRIDAY...JUST A QUICK UPDATE TO ADJUST SKY COVER BASED ON SATELLITE TRENDS WITH CLEARING TAKING PLACE OVER MOST OF THE AREA...THE EXCEPTION BEING THE NORTHERN ADIRONDACKS. OTHERWISE...LIGHT SNOW HAS ENDED OVER THE ENTIRE AREA EARLY THIS MORNING WITH PLENTY OF CLOUDS LINGERING OVER THE AREA. DRIER AIR OVER THE SAINT LAWRENCE VALLEY AND SOUTHEAST ONTARIO PROVINCE WILL MOVE IN AND SOME SUNSHINE IS EXPECTED TODAY. THIS WILL BE AN IMPORTANT ELEMENT TODAY BECAUSE THE LOW LEVEL WARMING WILL HELP STEEPEN LOW LEVEL LAPSE RATES LATER THIS MORNING AND EARLY AFTERNOON AHEAD OF ANOTHER UPPER LEVEL DISTURBANCE CURRENTLY OVER WESTERN QUEBEC PROVINCE. AS THIS FEATURE MOVES EAST...DYNAMIC SUPPORT WILL INCREASE OVER THE AREA...MOISTURE WILL INCREASE...AND COMBINED WITH THE STEEPENING LOW LEVEL LAPSE RATES...ISOLATED TO SCATTERED SHOWERS SHOULD DEVELOP. MOST WILL BE IN THE FORM OF SNOW SHOWERS...BUT TEMPERATURES IN THE SAINT LAWRENCE AND CHAMPLAIN VALLEYS WILL BE WARM ENOUGH FOR A MIX OF RAIN OR SNOW SHOWERS. NOT EXPECTING MUCH IN THE WAY OF ACCUMULATION WITH LOCALIZED AREAS UP TO AN INCH GIVEN THE CONVECTIVE NATURE OF THE PRECIPITATION. AS OF 353 AM EST FRIDAY...EXTENDED PORTION OF THE FORECAST LOOKS TO BE ACTIVE AND UNSEASONABLY COLD. SUNDAY NIGHT AN UPPER LEVEL SHORTWAVE PASSING NORTH OF OUR CWA WILL GIVE US A CHANCE FOR SOME SNOW SHOWERS...ESPECIALLY ACROSS OUR NORTHERN ZONES. ON MONDAY NEXT WEATHER SYSTEM WILL APPROACH FROM THE GREAT LAKES REGION...WITH COLD FRONTAL PASSAGE MONDAY NIGHT. SECONDARY LOW PRESSURE SYSTEM FORMS ALONG THE COAST...THEREFORE SHUNTING BULK OF PRECIPITATION CLOSER TO THE COAST. COLD AIR SURGES SOUTH OUT OF CANADA ON TUESDAY WITH UPPER TROF CROSSING OUR FORECAST AREA TUESDAY NIGHT. ANOTHER REINFORCING COLD FRONT AND UPPER LEVEL TROF CROSS THE REGION THURSDAY NIGHT. TEMPERATURES WILL BE WELL BELOW NORMAL THROUGH THE PERIOD. This was after some melting at about 9:30am here in Winooski. Not a big deal, but it gets us on the board as the first measurable of the season, which is always something to celebrate. This is one of the last trees in the area with any leaves left. Nothing at all from last night's event, few flakes fell but that's about it. I've got the J&E Productions Live Web Cam running at the house and I can see that it's snowing there, but there's nothing more than a dusting to report in terms of accumulation thus far. Been getting some steady snow showers at the ski resort the past couple hours. It must be making it into town too as MVL had vis under 1 mile for a time. Only .2-.3" accumulation at 1500ft, it's very convective type snowflakes with graupel balls mixed with better flakes from time to time. Certainly not like last nights amazing snow growth. BTV's snow summary...I ended with 2.3" as the highest I saw the snow get. I was really surprised to see the Stowe CoCoRAHS guy only show 1.0" this morning, as jvt24 and I both had a touch over 2", and 2-3" fits with the surrounding reports in Waterbury Center and Waterbury. It's definitely fired up now at the house – I just happened to take a look at our web cam and there are some pretty decent flakes in there and close to an inch of additional accumulation. I was picking up my season pass at Bolton (unfortunately I didn't have the camera with me) and a snow shower hit dropping vis under 1/4 mile. It was really coming down as I was getting ready to head back down.This was around 2:45pm or so. As Powder said it was definitely convective, with some graupel but at 2,000 ft in that burst there were definitely big fluffy flakes as well. It's been snowing on and off all day in Woodbury. Visibility has dropped to 1/4 - 1/2 mile several times. Very wintry at camp.